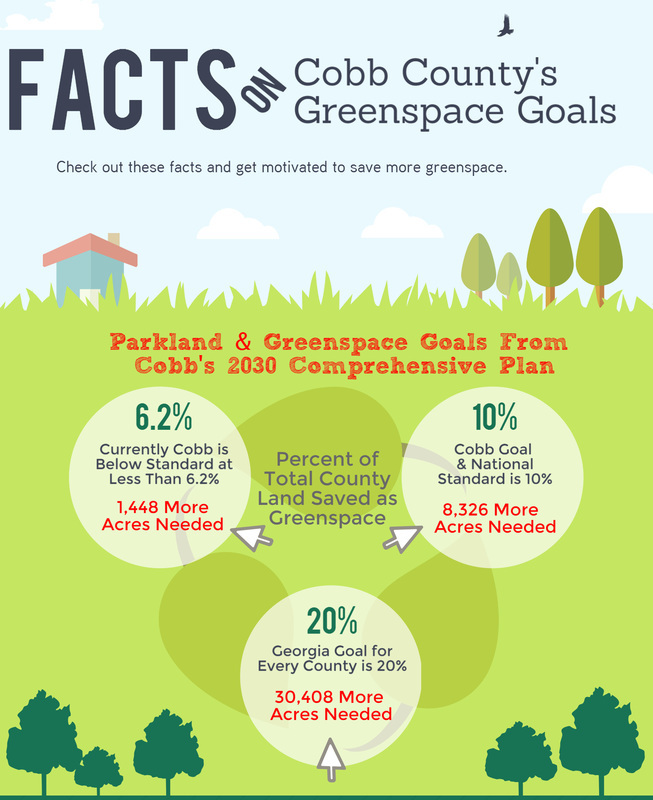 ​Let's look at the facts about the ratio of parks to people, and the goals Cobb County has set for itself. 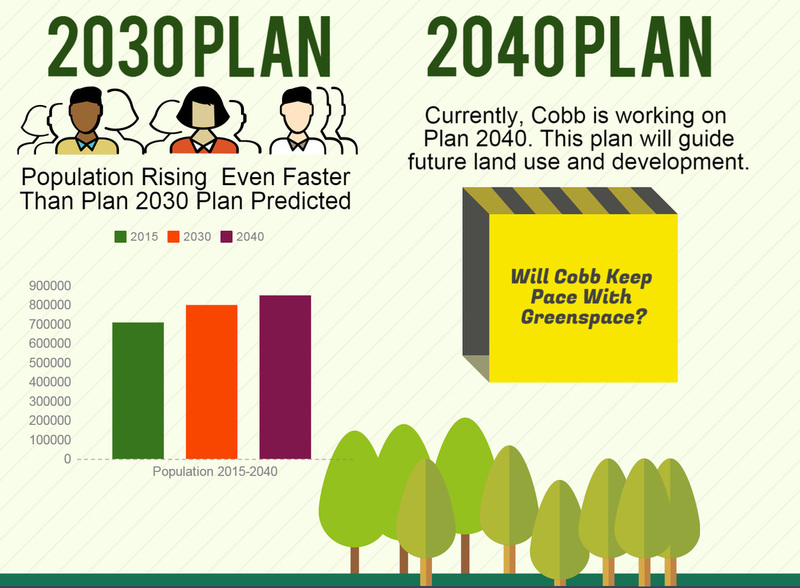 Cobb County's own long-range plan for the county called the 2030 Comprehensive Plan includes details on all areas in Cobb, preserving natural resources, and acquiring parkland. The 2030 Comprehensive Plan was prepared in 2005, before the passage of $40 million Park Bond 2006, which purchased nearly 400 acres of parkland, and $40 million Park Bond 2008, which has not been issued yet and has not purchased any parkland. These bond votes were in part fulfilling the county-wide goals for purchasing more parkland to improve the ratio of county land of greenspace to developed land. 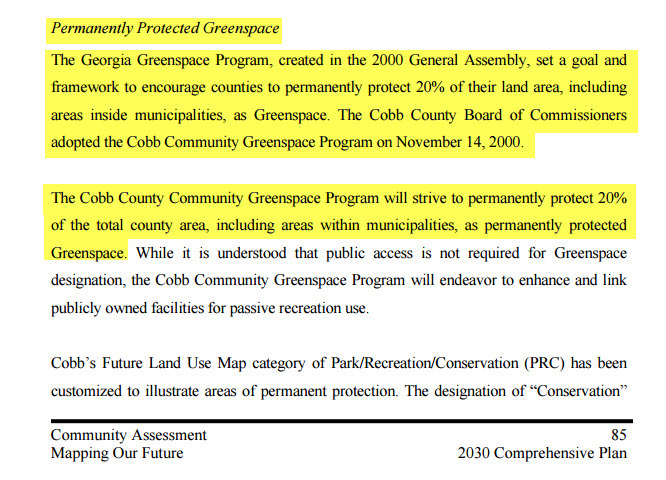 ​This Cobbline article was written after Park Bond 2006 and after the 2030 Comprehensive Plan was adopted. One clear quote: "Cobb County’s master plan calls for 10.5 acres of park space per 1,000 residents and the parks bond has helped move toward this goal." 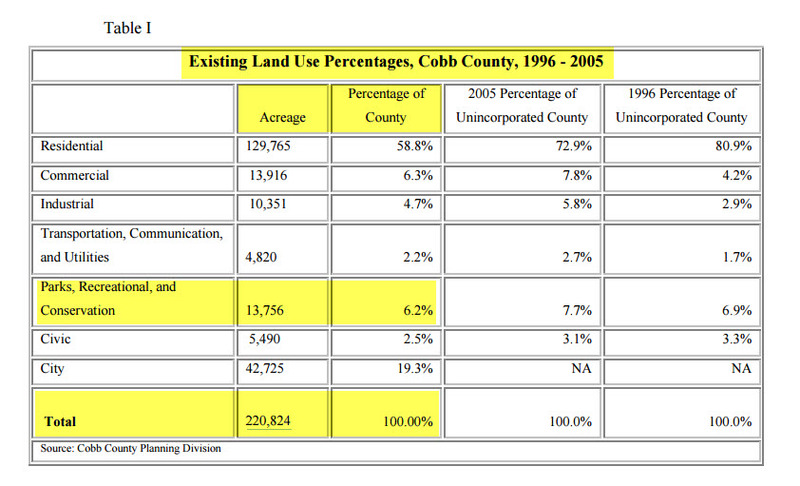 Another important statistic in on how much of a county is preserved as greenspace. 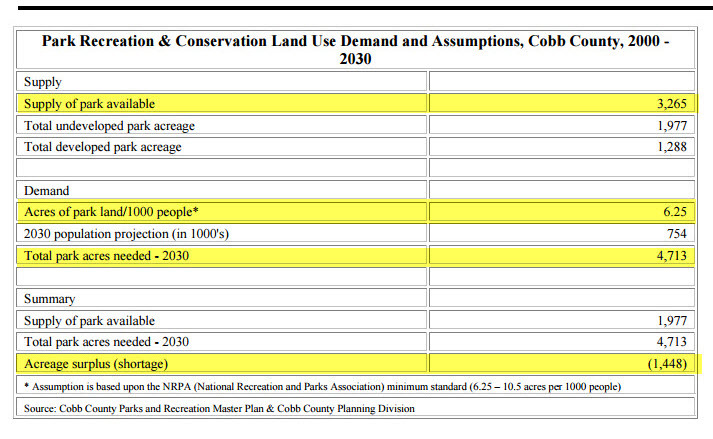 The Georgia goal is 20% of land, and currently Cobb has less than 6.25% of land preserved as greenspace, according to the Cobb 2030 Comprehensive Plan. ​Why preserve greenspace? Saving land has a Triple Bottom Line Benefit: It helps the social, environmental, and economic aspects of a community, also known as the "three pillars of sustainability": people, planet and profit. Park Bond 2008 would save about 350 acres, so Park Bond 2008 is an important first line of defense to protect and preserve the natural resources in Cobb County. ​Compare the 2030 Comprehensive Plan with the County's 23 January 2016 presentation at the Board of Commissioners Work Session and the revised version from November 2016 found on current Chairman Tim Lee's page.